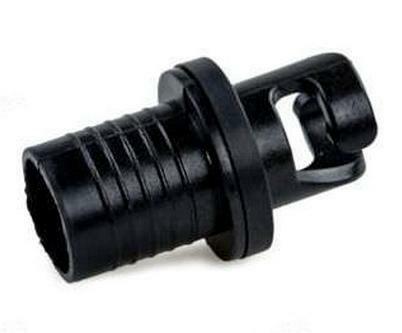 Deluxe Universal and Naru Valve Adaptor for Saturn Inflatable Boats. Our new deluxe universal valve adaptors can replace most valve adaptors for pushpin type of air valve for inflatable boats, rafts, kayaks and inflatable paddle boards. hese are the only adaptors that can be used with high pressure electric pumps, because deluxe adaptors provide larger opening for good air output and quicker inflation. Deluxe universal valve adaptor comes with set of 2 rubber seals (color may vary). Each seal has grove on it, in order to allow 4 different combination for best fit into air valve. You can install 1 or 2 seals, you can flip seals with grove in or out or you can cut out lip seal for better fit into air valve of your boat. Also available standard Naru N2 valve adaptors with rubber seals designed for perfect fit inside latest Naru N2 valves with green rubber seal on a cap. I needed a new standard Naru valve adapter with the green rubber seal and was told the new style would work. The one they sent is too big to fit into the manual pump hose. Called support and they told me to go to hardware store to get a short piece of vinyl hose and "make it work". Inquired about a replacement hose that the new fitting would work with and none are available. You have to buy the pump that comes with a hose and fittings.